Lock in a great price for Hotel Engel Liestal – rated 8.3 by recent guests! The room was spacious and well organized with a nice view. Staff very friendly. Good position close to the railway station and just in front of the old city's door. Room cleaned and good breakfast! Very nice accommodation with excellent, helpful and friendly staff. The restaurant was delightful. Well situated within Liestal and the free travel pass for the weekend was also very useful. A super nice hotel with super friendly staffs. Room is big and the hotel is just giving a genuine swiss feeling for me. The bed is so comfortable. Everything is so nice. Definitely will be my choice for next time..
Breakfast was yummy easy to get to the train station . Very friendly and helpful staff. Parking downstairs. The staff were friendly and the breakfast excellent. 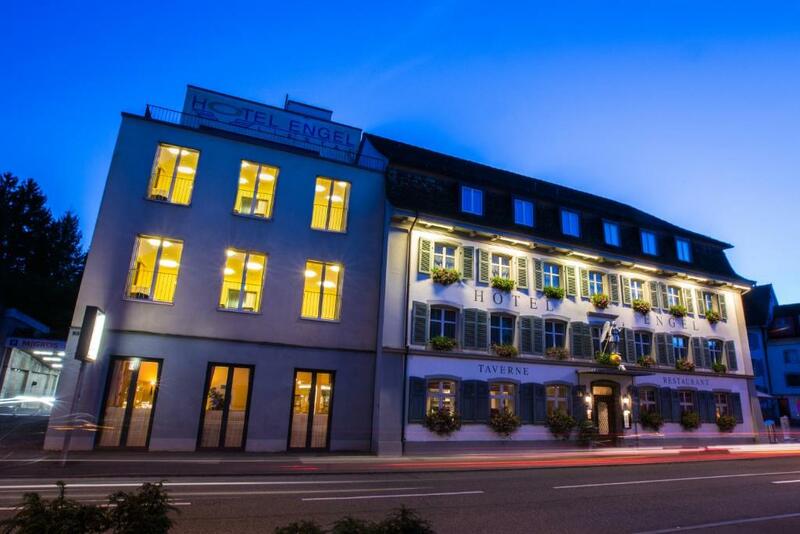 Hotel Engel Liestal This rating is a reflection of how the property compares to the industry standard when it comes to price, facilities and services available. It's based on a self-evaluation by the property. Use this rating to help choose your stay! The family-run Engel Liestal is located in the charming Old Town of Liestal, a 15-minute train ride from the center of Basel and its fairgrounds. Free WiFi is available in all areas. 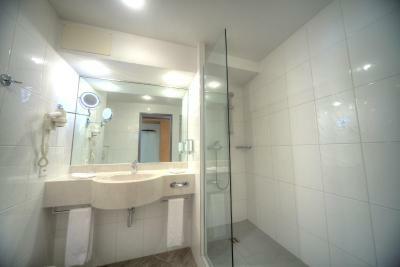 It offers a restaurant serving characteristic Swiss cuisine and rooms with attached bathroom with TV. Further on-site amenities include several even halls, one of which measures 400 square yards. Liestal´s train station can be reached within a few minutes´ walking distance and the Liestal hospital is also located nearby. This property also has one of the top-rated locations in Liestal! Guests are happier about it compared to other properties in the area. This property is also rated for the best value in Liestal! Guests are getting more for their money when compared to other properties in this city. When would you like to stay at Hotel Engel Liestal? This room is facing the main street of Liestal and comes with a granite desk, a mini-bar, a flat-screen TV, coffee and tea making facilities, and a bathroom with shower. All rooms are equipped with a centrally operated ventilation system. Public parking is available on site (reservation is not possible) and charges apply. This modern and spacious room comes with a furnished balcony overlooking the countryside. It features a flat-screen TV, a granite desk, a mini-bar, coffee and tea making facilities and a bathroom with shower. All rooms are equipped with a centrally operated ventilation system. This elegant and spacious room is overlooking the countryside of Basel or the Old Town of Liestal and features a flat-screen TV, a granite desk, a mini-bar, coffee and tea making facilities and a bathroom with shower. All rooms are equipped with a centrally operated ventilation system. This duplex room is set in the old roof truss from the 17th century. The lower floor offers a seating and working area, a bathroom with shower and a sofa bed. On the 2nd floor there is a sleeping area with french bed and an open bathroom with bath tub. Room amenities include a granite desk, a flat-screen TV, a mini-bar, coffee and tea making facilities, a bathrobe and slippers. All rooms are equipped with a centrally operated ventilation system. This spacious room overlooks the garden and the green hills of Baselland. It features a queen-size bed, a flat-screen TV and a coffee machine. All rooms are equipped with a centrally operated ventilation system. This room is facing the main street of Liestal or is located next to the elevator. It features a flat-screen TV, a granite desk, a mini-bar, coffee and tea making facilities and a bathroom with bath tub. All rooms are equipped with a centrally operated ventilation system. House Rules Hotel Engel Liestal takes special requests – add in the next step! Free! One child from 3 to 6 years stays free of charge in an extra bed. One child from 7 to 12 years is charged CHF 30 per person per night in an extra bed. One older child or adult is charged CHF 80 per person per night in an extra bed. Hotel Engel Liestal accepts these cards and reserves the right to temporarily hold an amount prior to arrival. Please inform the hotel if traveling with children and include their age. Breakfast ok. But not that much to chose between. Very Nice and big rooms. The room is a little bit old and may need some refreshment. I could have used another pillow. the bedroom was without a.c. and very loud. Only slight issue is that the room is a little warm (even in early spring) as there does not appear to be air any conditioning. You have to pay for the parking.